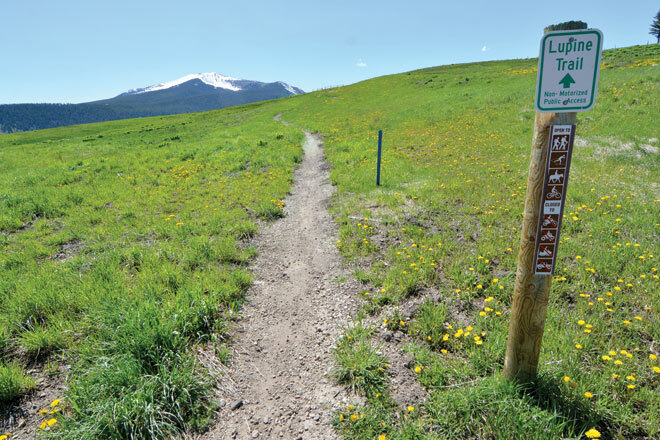 Trail workday season is upon us and the local crew of volunteers with the Crested Butte Mountain Bike Association (CBMBA) has already been in the hills tightening things up. CBMBA and a host of volunteers put in some work on the Point Lookout Trail last Saturday and now CBMBA and the Adaptive Sports Center (ASC) are joining forces to do some work on the first portion of the Lupine Trail, aka Lupine I, on National Trails Day, Saturday, June 6. According to Chris Hensley, executive director for the ASC, the second portion of the Lupine Trail, Lupine II, is the “gold standard” for how trails near town should be built and the wider track works for handcyclists. With a wider track on the first section of the Lupine Trail starting at the Saddle Ridge cul-de-sac, handcyclists can then ride from Mt. Crested Butte to town via the Lupine and Lower Lower Loop. As of right now, the Lupine II portion works for handcycles but access is somewhat difficult. Improvements to Lupine I would play out well for handcycles, providing a longer section of trail and linking the two towns together. “If we get Lupine I done, we can do a ride to town and the usage should jump,” says Hensley. The additional section of trail will also play a pivotal role when the ASC and ReActive Adaptations host the Off Road Handcycling Summit event August 21-24. The summit will include rides on the local trails as well as the return of the Off Road Handcycling World Championships to Crested Butte. “Off road handcycling is definitely growing,” says Hensley. The ASC and CBMBA are looking for volunteers to do trail maintenance from 9 a.m. to roughly 1 p.m. The work will take place from the first to the second rollovers (from the Saddle Ridge). Since there is no parking on the Saddle Ridge cul-de-sac, either ride your bike up to the trailhead, or meet at the Four-way Stop parking lot for shuttles leaving at 8:45 a.m. and 9:15 a.m. Please do not drive your personal vehicles up, as this is private property and there will be no place for you to park. Don’t forget your work gloves, sturdy shoes, rain gear and a hydration pack or water bottle. Directly after the trail work, CBMBA and the ASC will have a grill-out at 325 Belleview Ave. (the Adaptive Building in town) for all of the volunteers.